When the asparagus season arrives I am always reminded of my time living in Spain. I went to live there in my early twenties, to indulge in my family heritage and spend some time with my paternal grandparents (my Abuelos). My Abuelos had some horticultural land nearby Valencia and they would grow their own asparagus, among many other things. As such, we would have tonnes of it all at once! In the evenings, when meals were supposed to be lighter (and much later in the day than I was used to), my Abuela would cook up a small one of these for our supper and serve it with a piece grilled meat and some fresh crusty baguette. 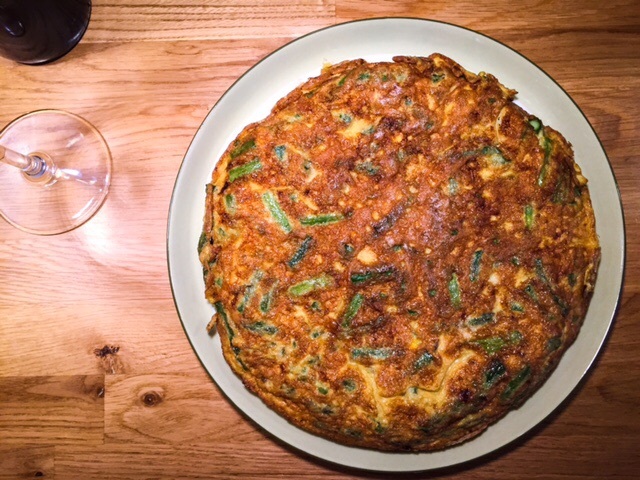 It is basically a tortilla (Spanish omelet) with the potato replaced with asparagus. I find this a welcome change on a warm summer evening. Serve it with alioli and crusty baguette. Serves 2 on its own, or 4 with a salad or other accompaniment. Begin by preparing the asparagus. Once you have washed the asparagus, remove the woody end and cut the spears into ~2cm lengths. Add a little olive oil to a medium sized non-stick frying pan and warm over medium heat. Add the cut asparagus and saute until they are cooked through but still firm. They should not be brown – I find a taste test here does the job nicely! Season with salt. Whilst the asparagus is cooking, break the eggs into a large bowl and whisk together. Once the asparagus has cooked, tip them into the beaten eggs and stir through, ensuring each piece is coated with the egg. (The more skilled among you may be able to pour the egg directly into the frying pan and mix it into the asparagus – I however, have not been able to perfect this skill. Leaving chunks to come apart as they were uncoated by the egg!) Make sure there is still a little oil left in the pan, or add a little more, then pour the egg and asparagus back into the pan. Use a fork to spread the asparagus evenly about the pan. Leave on a low heat to cook the bottom side of the omelet. You want as much of the egg to cook through as possible without burning the bottom. Once you have flipped the omelet over, you will then want to slide the omelet back into the pan with the cooked side facing up. Return to the heat and continue until the underside has cooked through and has a nice golden colour. Serve with some crusty bread, alioli and a small salad.